The Alaska Legislature has agreed on school funding levels for the next two years, with strings attached, but the debate about how much the state spends is far from over amid the scrutiny on Alaska’s teacher pay and national teacher strikes. Under House Bill 287, now passed by both the House and the Senate, districts stand to gain $117 more per student per year in the base student allocation, or BSA, starting in the 2019-20 school year. If the legislation moves, another nearly $30 million will be added to the state’s $1.2 billion education budget starting 2020 fiscal year, though at this date the passage of the bill is contingent on passing the funding source. If enacted, it would raise the BSA from $5,930 to $6,047 per student. Senate Bill 26, the contingent funding source passed by the Senate and agreed to by the House in its concurrence with HB 287, would use a portion of the Permanent Fund earnings each year to help fill the state budget deficit. Educating each Alaskan student costs more than $20,000 per pupil, the fourth highest of all 50 states and the District of Columbia, according to the National Education Association. As a percent of total income, no state spends more on education than Alaska, also according to NEA data. How that translates into keeping teachers and recruiting more to fill a current backlog of vacancies creates the apparent contradiction of Alaska already spending huge sums yet not spending enough, according to the dozens of educators and advocates who descended on Juneau in April during budget talks. Alaska’s educators may have it better than perceived, however, in light of the pension disasters currently unfolding in the Lower 48 that are a factor in the recent teacher strikes in multiple states. Where does Alaska teacher pay rank? Teachers in Alaska rank seventh in the nation for pay, according to the latest data put out by the NEA in a comparison of all 50 states and the District of Columbia. According the NEA, the state of New York had the highest paid-teachers at an average of $77,628 for the 2015-2016 school year. Alaska’s average teacher pay in 2016 was $67,433, which is about $9,000 more than the national teacher average. According to the Bureau of Labor Statistics, the average income for all occupations in Alaska is $57,750. 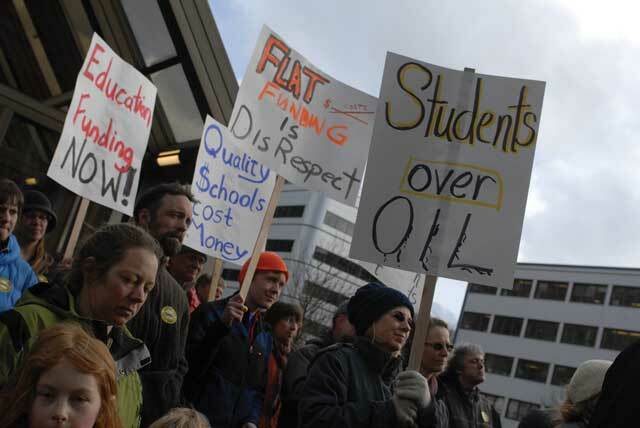 Tim Parker, the president of the National Education Association Alaska Chapter, believes pay for Alaska teachers has slipped downward, and coupled with less attractive benefits, contributes to the current teacher shortage. Parker has taught English and journalism in Fairbanks high schools for the past 20 years, but is currently on leave from that role as he’s midway through a four-year term as the NEA president, a post he says serves well in his role to highlight real workaday issues impacting the state of Alaska’s education. As president, he has visited 30 of the 54 school districts. “I spend about 50 percent of my time out traveling school to school,” he said. Parker sees a crisis in the making that involves not having enough teachers for each classroom in the near future. For a variety of reasons, the state isn’t attracting enough new teachers either through the University of Alaska programs or through outside recruitment, he said. The teacher protests in West Virginia, Colorado, Arizona and Oklahoma are spurred by complaints of poor pay, but Parker says the teacher pension system in certain states are better than Alaska’s. Despite Alaska’s No. 7 rank in teacher salary, Parker said it’s a “falsehood” that they are among the highest-paid in the nation. The cost of living expenses also push Alaska down in attracting new teachers, he said. A $50,000 annual salary here — common pay for newer teachers in the state — spends like $40,000 given higher rent, mortgages, fuel, groceries and even car payments. At job fairs, one of the main ways officials entice new teachers to the state, Alaskan recruiters are finding themselves beat out by recruiters in California, Oregon and Washington, Parker said. Only California ranks higher than Alaska in teacher pay, at No. 4. Washington ranks No. 25 and Oregon is No. 14, but both have lower costs of living. Yet any cost-of-living comparisons should also note that Alaska has no state income, sales or property taxes. The Lower 48 economy is also booming right now with record-low unemployment while Alaska remains mired in a slow-motion recession. “Superintendents, principals and human resource people trying to hire teachers right now know how uncompetitive Alaska has come,” Parker said. “It has been coming about for about five years as money has been drastically cut out of budgets due to flat funding and inflation. We are very close to a crisis. He blames the problem in part on the way pink slips have driven out teachers. The Alaska Legislature finally passed a budget last year on June 23 letting districts know the dollars that would be coming to their districts. “We lost a lot of teachers that say ‘I either have to sign or contract, or I could be waiting tables next year,’” he said. Education advocates claim that Alaska’s retirement system works against it in recruiting, but national organizations that have graded all 50 states rate it among the best for new teachers. Alaska shifted from a defined benefit pension system to a defined contribution system for all teachers hired after Jan. 1, 2006. A defined benefit system meant teachers would know a dollar amount they would receive annually, say, a set $49,000 per year. Under the change in 2006, 401ks became the established retirement system. The teacher contributes 8 percent of his or her salary and the state matches another 8 percent, a much more generous match than can be found in most private sector 401k plans. The problem is that teachers won’t be able to plan on a known dollar amount per year for their retirement, Parker said. However, across the country school systems have accumulated $500 billion in pension debt obligations, with wages eroding to fund the debts and future retirees having their benefits cut. Two organizations that have studied the issue recommend moves like Alaska’s toward defined contribution, portable, 401k-style plans. Bellweather Education Partners, a national nonpartisan group dedicated to helping education organizations achieve better results, made Alaska one of only 9 states that didn’t get an “F” for their pension systems. Instead, a “D” grade came in a June 2017 report called “Retirement Reality Check,” that analyzed the nation’s troubled pension systems state-by-state. Alaska was given at least a passing grade thanks to the fact that 100 percent of an employees’ contributions toward retirement are their own and don’t go toward paying off pension debts. It was given a low grade, however, because Alaska still has a more than $3 billion in debt for its teacher pension fund. The report recommends states put teachers back into the Social Security system and that new teachers be placed into defined contribution, portable retirement plans such as a 401k as the default option. And it charts the portions of teachers’ pensions that go to pay down pension debt, noting in Alaska teachers hired after 2006 in 401k programs keep 100 percent of their retirement contributions compared to the national average of 28 percent, with the rest of the contributions paid for pensions going toward the states’ debts. In Colorado, one of the state’s Bellweather graded “F,” the bulk of the money school districts spend on the Public Employees’ Retirement Association is paying off $32 billion in benefits previously promised to public-sector retirees but never properly funded. Striking teachers in Denver protest that just $3 of every $20 spent per teacher goes to their retirement, according to an analysis the state retirement system. The National Council on Teacher Quality, or NCTQ, gave Alaska the only “A” grade in its “Doing the Math on Teacher Pensions” report in January 2015. Urban Policy Institute, in “The State of Retirement: Grading America’s Public Pension Plans” report, gave Alaska a “B” grade overall for the system for new teachers. Both Bellweather and NCTQ recommend defined contribution and portable plans for new teachers, instead of defined benefits with lengthy periods to vest. They make the recommendation as a way out of the defined benefits mess that placed school districts deeply in debt with new teachers paying pensions for its retired teachers, and having their future benefits cut at the same time wages are being frozen. Teachers in the current 401k plan dubbed it the “Death Tier,” Parker said. That’s primarily because, with Social Security off the table, teachers are forced to count on an unknown dollar amount. “They call it that because you have to work until you die and you can’t afford to retire,” Parker said. Younger teachers will have an easier path than those closing in on retirement, Parker has told legislators in testimony. At the end of five years, they are 100 percent vested, meaning they are eligible to withdraw the funds and reinvest. “The state is no longer making a long term investment in their retirement; and after five years you can take all of your money and all the state’s money and go someplace else,” Parker said. This contributes to the state’s teacher drain. “It’s almost like we’re giving an incentive for teachers to leave,” especially if they work in districts where pink slips hang over teachers’ heads during difficult budget years, Parker said. However, as Bellweather, NCTQ and Urban Policy Institute have noted in their reports, and evidenced by the benefit and wage cuts in the Lower 48 tied to recent teacher unrest, defined pension benefits are not likely to survive in their current form. In Anchorage, the district shouldered 100 percent of the $19,740 per year benefit package, setting it apart from other large districts in Fairbanks, Juneau and the Kenai Peninsula, and the district’s health care costs rose alarmingly in 2016-17, ASD Chief Financial Officer Jim Anderson testified in Juneau. These costs bit into dollars meant for classrooms, Anderson said. The cost of deductibles and portions of health care has risen, and necessitated some contract changes that mean some bargaining units pay a portion of their health care, Parker said. Still, that is new for this contract year and doesn’t impact all of the ASD employees who are separated into bargaining units via job designations. Still, given the entire picture, Alaska teachers are paid well when considering an overall package of pay, says Boyle. When there was no employee match in the Anchorage School District for health care coverage, that was a sweet deal, he said, that few other school districts were allowing. Around the state, who paid what of their health insurance showed differing pictures. Of the 54 school districts in Alaska, only 14 of the districts were paying 100 percent of the health insurance premium in 2016. The other 40, even far-flung village districts, pitched in at least a 10 percent match. The demise of the teacher pension system is an area noted as bringing down the value of a benefits package, said Scott MacManus, the superintendent of the Alaska Gateway School District that is headquartered in Tok. MacManus does outreach at job fairs in the Lower 48 in order to hire his new teachers. Alaska’s 401k plan, when discussed in recruitment, is “not seen favorably” MacManus said. But in the overall picture of how much gets spent by the state on education, Alaska Policy Forum’s Boyle sees progress in its Tier 3, or 401k, retirement system.